Being totally up-front about its style of music, the tunnel vision of SK8 or Die may be a bit lacking, but at least this trio plays with the kind of fervor that will make skaters try all of the rad moves they've always wanted. 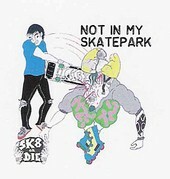 Not in my Skatepark should come with a purchase of a skateboard, as more than half of the tracks on the disc have skate in the title and denounce such travesties as rollerblading. SK8 or Die is hard to take seriously, unless you've taken one too many falls on a half pipe, but if you're looking for some old fashioned lo-fi rock 'n' roll to thrash around to, look no more.